Before we go into the details, we would like to briefly summarize the general concept of Denon’s multi-room system for all newcomers: In principle, it is about streaming music from one or more sources via the network into one or several rooms and via the HEOS speakers, an already existing stereo system or even an AV receiver. The control is done centrally via the HEOS app (iOS / Android / Fire OS). According to the order of this concise summary, we will now look at the individual aspects more closely. The first category includes the supported online streaming providers Spotify, Deezer, Tidal, Napster and Soundcloud as well as the internet radio and podcast platform TuneIn and the portal Mood, which is mainly interesting for companies: Mix. 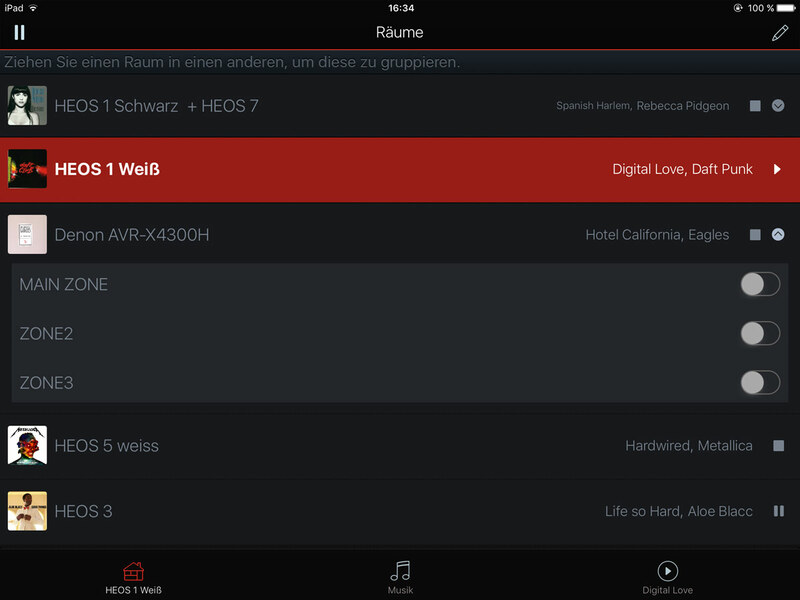 In addition, of course, locally stored music files can also be integrated into a HEOS system. These can be, for example, on a smartphone or tablet, on a USB stick or a computer, NAS (Network Attached Storage) or a special music server – only DLNA compatibility is required. The high-resolution formats (WAV, FLAC, ALAC up to a maximum of 192 kHz / 24-bit, DSD 2.8 and 5.6 MHz) as well as Which supports wireless Bluetooth transmission. In addition, it is also possible to feed signals from a CD player, TV set or record player into a HEOS network and distribute them to the connected playback systems. Let’s now turn to a total of ten HEOS components. First, Denon offers a total of four different HEOS loudspeakers, all of which are designed as active loudspeakers – the amplifier stage is thus already integrated into the housing and exactly matched to the loudspeaker system. Since the models use different room sizes and usage scenarios, there are some differences in size and the driver concept. For example, the two large HEOS 7 and HEOS 5 loudspeakers have five or four drivers and two or a passive diaphragm – the latter improve the bass performance for small loudspeaker systems similar to a bass reflex channel – and are thus also capable of compelling medium-sized rooms convincingly. With the two smaller models HEOS 3 and HEOS 1, a few smears are of course inevitable in the direct comparison. Nevertheless, the HEOS 3, which can also be set vertically with its two full-range loudspeakers, and the HEOS 1 with a two-way system within the scope of the possibilities sound really good. With regard to the range of functions, the models are virtually identical. Two devices can be connected to a stereo set and, if installed, a convincing stereo stage can be produced. 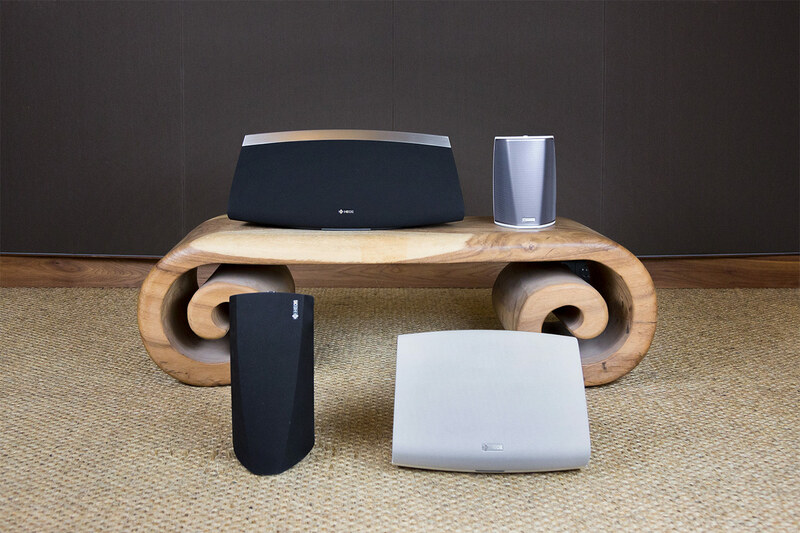 In addition, all HEOS loudspeakers have rudimentary connectivity options. These include an Ethernet jack in case a wireless connection is not possible, an analogue Aux input with 3.5 mm mini-jack format as well as a USB jack. Particularly noteworthy is the headphone input built exclusively for the HEOS 7 as well as the possibility to operate the HEOS 1 completely wirelessly thanks to the HEOS GoPack accumulator module. In combination with the Bluetooth functionality, the HEOS 1 becomes a mobile playback system for the road. In addition, the developers have specially designed this model to provide a relative insensitivity to moisture, so that the smallest HEOS speaker can be used in the bathroom. 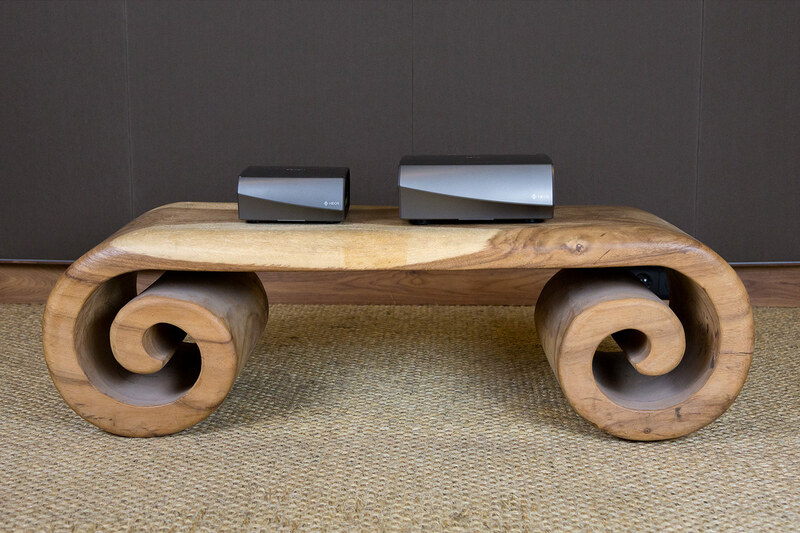 In addition to the loudspeakers, there are two devices in the HEOS world called HEOS Link and HEOS Amp, which generally permit the integration of other HiFi components into a HEOS system. The first is, in principle, a compact preamplifier, which is designed specifically for reception within a HEOS network and, on the other hand, serves as an interface to other devices thanks to various inputs and outputs. An analog pre-out as well as a subwoofer output in the RCA format are available – here you can directly control a power amplifier and an active subwoofer if necessary. In contrast, the digital connections – coaxial and TOSLINK – bypass the internal D / A conversion and send the signal to an external digital-to-analog converter. Similar to the HEOS loudspeakers, the HEOS Link also offers a variety of input options, but this is a bit more comprehensive. In addition to the Aux input, USB jack and Ethernet jack, there is also an RCA input and a TOSLINK format digital input. The HEOS Amp is absolutely identical on the input side, but – as the name implies – has an integrated power amplifier (2 x 70 watts at 8 ohms) and thus the obligatory terminal for the connection of passive loudspeakers. In addition, an active subwoofer can also be connected here. Finally, we would like to mention HEOS Extend and HEOS Drive. The latter is a rack-shaped solution specially designed for professional or user-defined installations, which has four separately controllable amplifier units and can, for example, also be integrated into a more complex home control system. HEOS Extend provides, if necessary, as a network amplifier for a stable signal over longer distances. After we have introduced all the HEFi-relevant HEOS components, we will now devote ourselves to the AV solutions from the HEOS universe. 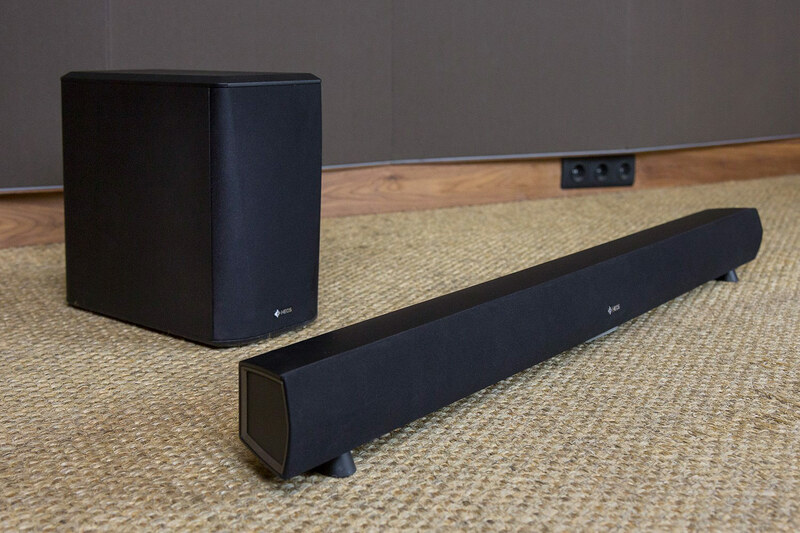 Here, the HEOS HomeCinema package, which consists of a classic stereo soundbar and a matching subwoofer, should be mentioned first. Apart from the HDMI interfaces (input and output, including HDCP 2.2), the connections do not differ significantly from the already mentioned devices and, of course, the HomeCinema bundle also fits into a more complex HEOS system without restrictions. Now that we have introduced all devices from the HEOS universe, we finally take a look at the HEOS app. As mentioned above, this is available for the iOS, Android and Fire OS operating systems and the central control software for all HEOS components used in a network. From here, all streaming providers as well as local storage media and analogue inputs can be managed, which distribute music data from different sources (even at the same time) to individual rooms or groups of several rooms and store individual playlists and settings – thanks to storable user profiles also for several people. A total of 32 HEOS playback systems can be controlled at the same time, which can also be grouped into groups with a maximum of eight systems each. Other features such as the Equalizer accessible via the playback control at any time, the mentioned stereo coupling of two loudspeakers or the possibility sources in the menu individually underline the elaborate operating concept. 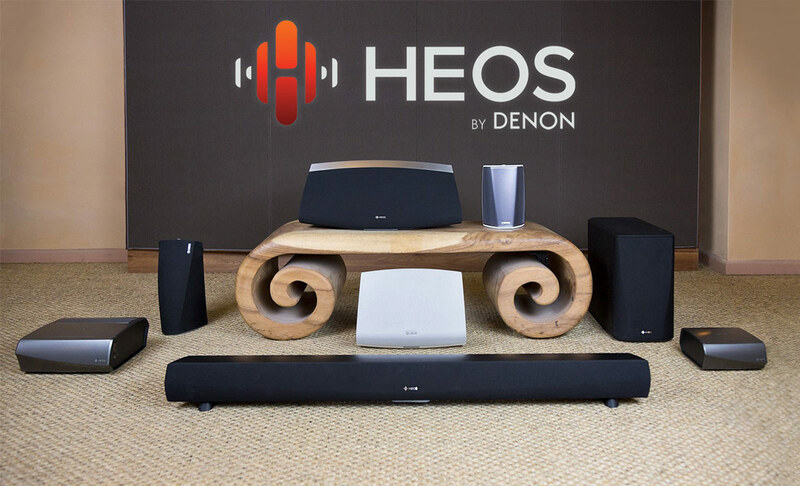 HEOS from Denon is one of the most popular multiroom systems currently in demand. 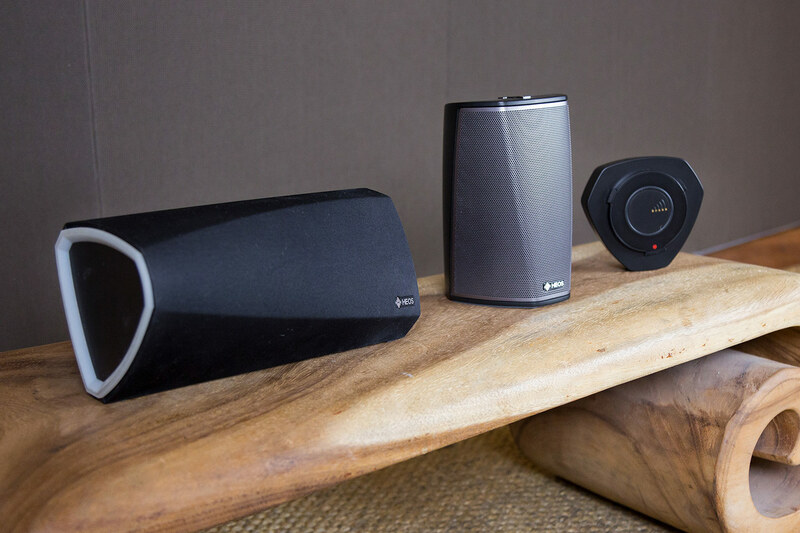 Despite the compact dimensions, all speakers sound very good – this is not always self-evident in this device class – and the app ensures comfortable and delay-free handling. Features such as high-resolution playback, consistent Bluetooth support or mobile and within limits moisture-resistant HEOS 1 expediently expand the application possibilities and round off the already good impression.